ALD Expert Eye – ALD Service in a new dimension. ALD experts can use ALD Expert Eye to provide you with support online – almost like they were standing right beside you. No matter whether you need help maintaining a machine or operating a system: ALD support is arranged and at your service within just a few minutes. 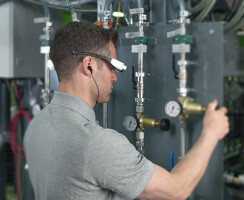 You can use ALD Expert Eye flexibly in your production environment – directly at the machine where you need ALD’s support. ALD experts see exactly what you see live on their own screens, so they can provide targeted advice and instructions. ALD experts can also send you images, photos, diagrams, and instructions on your smart device (data glasses, smartphone, tablet, or PC). They can even extract images from the live stream for joint live editing. If you need further information from ALD, the ALD service department can provide it to you through screen sharing on your device. ALD can use the diverse options provided by ALD Expert Eye to give you the best possible support for your specific situation. Proven in practice: ALD Expert Eye can be used to handle service calls quickly, efficiently and successfully. With ALD Expert Eye, both sides are spared the need to waste time clarifying problems through multiple calls and e-mails. And if you do need an onsite visit from an ALD technician, ALD Expert Eye can be used to inspect your machine online in advance so the ALD technician will have the replacement parts you need when they arrive. Either way you use the service, here’s what counts for you: ALD Expert Eye allows you to restore your system far more quickly, resulting in shorter downtimes. Efficient online support from ALD experts. Various ways to use it in maintenance, system operations, training, etc. Quickly and efficiently correct faults, short downtimes, and ensure that your systems have a higher productivity. An ALD Expert Eye session can get started in just a few minutes. All you need is to place a quick call to the ALD service hotline – a few minutes later, your online session will be activated. In order to do so, your company will first need to have concluded a framework agreement with ALD governing the use of ALD Expert Eye. If you don’t have a framework agreement, you can set up a pay-per-view ALD Expert Eye session. An internet connection at the work site, e.g. WiFi or LTE service. Either a smartphone, tablet, laptop, or – for optimal ALD Expert Eye function – audio visual data glasses. The ALD Expert Eye app or browser application. A framework agreement with ALD for using ALD Expert Eye, or a pay-per-view agreement. Your device – It’s your choice! Audio visual data glasses (current Android or iOS operating system) with integrated video camera, head-up display (HUD) and headset. This allows you to keep your hands free. The video camera and ALD expert will always be looking in the same direction you do. You can use the head-up display to operate the app and get feedback from ALD experts. Smartphone or tablet (current Android or iOS operating system) with an integrated video camera, preferably with a headset. Installed ALD Expert Eye app or webclient in your Chrome browser. Laptop (Microsoft Windows) with video camera and headset, installed “ALD Expert Eye-Desktop” application or web-client in your Chrome browser.